WASHINGTON, DC - Today, U.S. Rep. Hal Rogers (R-Ky.) voted to support a resolution of disapproval (H.J. Res. 36) to overturn the Stream Protection Rule that was handed down by the Obama Administration in its final days. As written, the Stream Protection Rule threatens one-third of the nation's coal mining jobs. The House passed the resolution in order to protect jobs and return regulatory power to each state. During the rulemaking process, the Office of Surface Mining and Regulation Enforcement (OSMRE) failed to work with the states to share all scientific data and relevant information. As a result, eleven states withdrew as cooperating agencies. The House Committee on Natural Resources' investigation into OSMRE's rulemaking process revealed gross mismanagement. "Mr. Speaker, President Obama made it his mission to bankrupt the coal industry when he took office – and through a slew of job-killing regulations, he’s nearly made good on that promise. His Administration spent seven years and over $10 million in taxpayer dollars writing the Stream Protection rule. Even though the bipartisan 2016 Omnibus Appropriations bill directed the Interior Department to engage with the States before finalizing this rule, the agency refused to comply - leaving crucial voices out of the rulemaking process. "Under this midnight regulation, at least half of the nation’s coal reserves would be restricted from mining and one-third of current coal related jobs would be at risk. This would mean devastating job losses in coal communities across the country – especially in Kentucky, where we’ve already got nearly 13,000 miners out of work. "It’s time to end the madness and give coal communities a chance to rebuild. I urge my colleagues to join me in supporting this resolution. Thank you and I yield back." 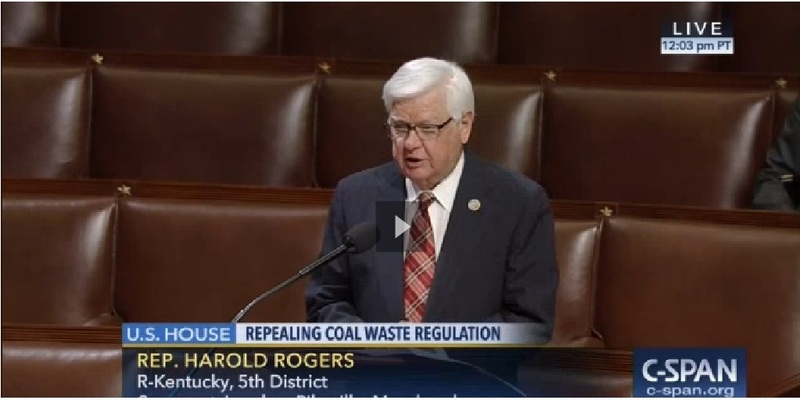 Click the video clip to watch Congressman Rogers' floor speech.